Back in the early 1970s I was a keen photographer with a home darkroom. Few venues exhibited photographs. Camera clubs and the Royal Photographic Society showed “pictorialism” which harked back to Edwardian times. These were mostly uncontentious, pretty pictures, that avoided anything contemporary. There were very occasional shows by the grand old men of photography: Bill Brandt, Cartier Bresson, and Jacques Henri Lartigue. The sort of photography that I aspired to take was to be seen in the Sunday Times Colour supplement, fashion magazines and newspapers. Sue Davies founded the Photographers Gallery in Great Newport Street in the 1970s, which was a breath of fresh air. Politically aware, agitprop, grassroots photography, along with community darkrooms seems to have sprung into existence in the 1970s. The idea that working class people, most of the population, could say something about the world, and get it exhibited, or self-publish was quite unusual then. I went to several exhibitions in the early 1970s at the Half Moon Gallery in Alie Street, Whitechapel which showed socially aware, documentary photography. I also remember Centerprise on Kingsland High Road, roughly opposite the Rio Cinema, and the Hackney Peoples Press. On Saturday I walked along to see the exhibition Radical Visions at Four Corners at 121 Roman Road, E2 0QN. This exhibition starts with the Alie Street days and shows lots of Camerawork magazine covers, some of which I’d bought at the time. Many of the names mentioned this fascinating exhibition are familiar to me, although they weren’t personal friends. In the 1970s and 80s I and a number of friends in photography used to discuss all this work and ideas, swap books, and go to talks. 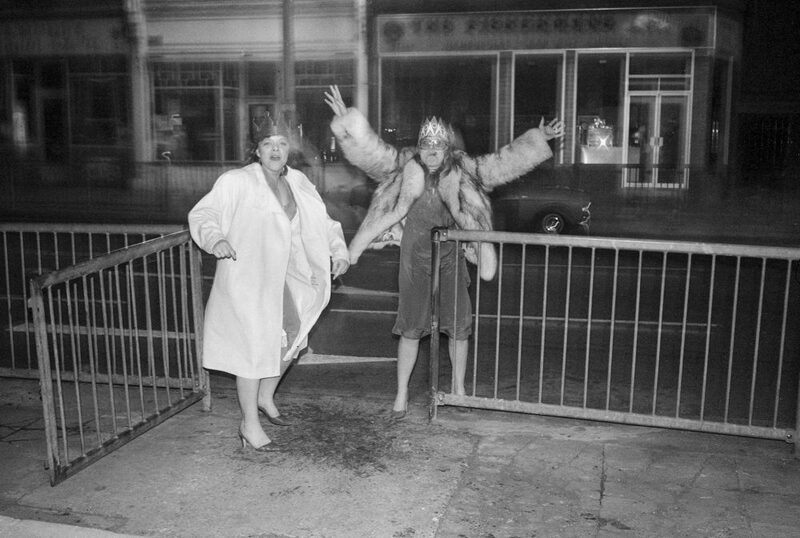 One of my photos: New Years Eve, Wood Green, 1970s. I don’t know who they were! Back in 1974/5 I helped organise and participate in “Pertinent Images” and “Haringey Snaps” two big exhibitions at Haringey Arts Centre. The first comprised photos taken by our own ad-hoc group. For Haringey Snaps we invited members of the public to send in their own photos of Haringey. Looking back I don’t think we were that good – but we did have a lot of fun. Until I saw this brilliant exhibition I hadn’t clocked how significant this British movement in photography was. Four Corners have also launched an online digital archive. Here’s what they’ve got on East London. I can fully recommend visiting Radical Visions – the early history of Four Corners and Camerawork 1972 – 1987. The exhibition is free and on until 22nd September 2018, open Tues-Sat 11-6. They’re selling a history of the movement mocked up a bit like a Camerawork magazine for £5 which I think is really good (top photo). What a fab photo. That exhibition was really good. Hi. Alan. 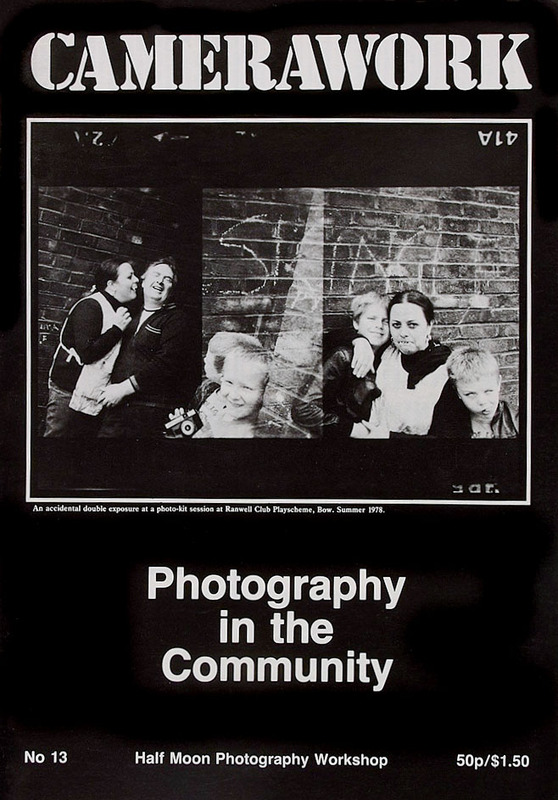 Great Story about Community Photography in the 1970’s. Ray. When I saw the exhibition all these memories came flooding back! I inhabited two different worlds then. I’d soon become a professional photographer, with attention to detail, able to meet tough deadlines and deal with demanding clients. Then I’d come home and socialise with very different groups of people, with very different ideas, especially in Hackney. In the 1930s photographers who got published had often been to public schools. They had the money to buy expensive German cameras, the leisure time to learn photography, and ex-school chums in high places who would give them jobs. During WW2 working class men in the forces had been taught photography. They became the generation of photographers behind mine. Some of them taught me.